Barely over an inch of thickness and only 1.6 lbs of weight, the HAVIT 15.6"-17" laptop cooler is ultra-portable and protects your investment wherever you go. The high-quality multi-directional metal mesh of HV-F2056 15.6"-17" laptop cooler provides your laptop with a wear-resisting and stable laptop carrying surface. Three large 110mm fans provide superior airflow at whisper quiet noise levels, spinning at just over 1,000 RPM. 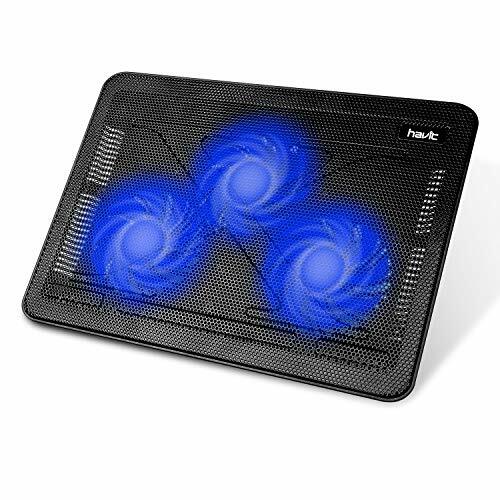 The HAVIT 15.6"-17" laptop cooler provides a strong 65 CFM of air flow allowing you to work all day without making any noise and interrupting your flow. Need extra USB ports while using HAVIT 15.6"-17" laptop cooler? Just plug it into one of the two USB ports on the laptop cooler. [Extra USB Ports]: Extra USB port and power switch design. Built-in dual-USB hub allows for connecting more USB devices.Warm Tips: The packaged cable is USB to USB connection. Type C connection devices need to prepare an Type C to USB adapter .